Food recipe analogies work really well for digital marketing – they are relatable and directly apply to the process of making something happen from a sequence of events. So brace yourself: a recipe analogy is coming your way. There is a reason that cooking recipes involve multiple ingredients that you manipulate and alter for a new outcome. Sure, you can eat cheese or tomatoes on their own and they are delicious. But when you mix them with your favorite toppings and bake them in the oven for 15 minutes, you get an outcome of pizza. The deliciousness factor far exceeds the sum of its parts. Many businesses start (or even run for years) just trying one thing — SEO, or Instagram, or PPC — and it may work. But study after study shows that these strategies are so much more effective when used concurrently toward an overarching strategic plan. Much like recipes, the return on investment will far exceed the sum of the parts alone. But how do you prioritize and leverage multiple channels? Let’s dig in. Most people who dabble in digital marketing have at least a basic understanding of the difference between organic and paid distribution. 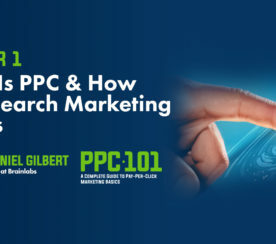 While the idea of “free” marketing vs. advertising existed before the internet, these terms were tracked more specifically as metrics with the onset of search engine optimization. It became a simple math equation — if you get more “free” (organic) traffic to your website, and your number of customers increases at the same rate, your overall cost to acquire new customers goes down. Hence, people became interested in how to get more of this organic traffic and scale their business at a more cost-effective rate. Often, however, this thinking is very siloed. Especially for people who specialize in marketing (as opposed to small and medium-sized business owners). Historically, most specialists find themselves on one side or the other: organic or paid. Organic marketers focused on search engine optimization and paid marketers focused on search engine and display ads. Then came social media. At first social platforms were lumped into a bucket all their own. It’s true that they are effective for content distribution, so do they belong to organic? But then they went and added paid promotion functionality, so are they paid? 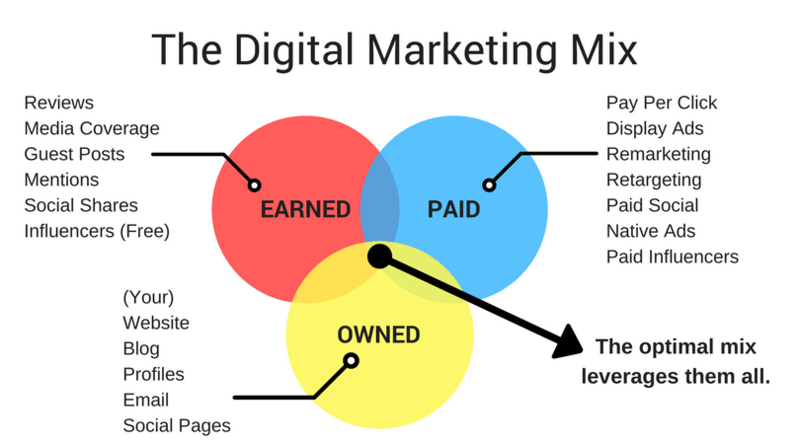 As you can see, it doesn’t really make sense to categorize your digital marketing efforts solely as organic or paid. 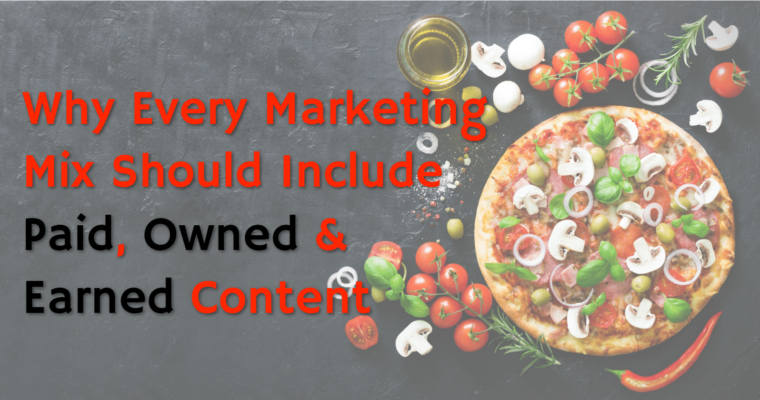 There is a more descriptive way that will help you consider the whole marketing mix and ensure that you end up with a delicious, cheesy pizza (A.K.A. a strategic campaign). Instead of categorizing your marketing efforts by how you acquire the traffic, think instead about who owns that property. Categorizing your efforts into owned, earned, and paid is about identifying how your content achieves a seat at the audience table. A healthy marketing strategy in 2018 and beyond factors in each of these types of digital media distribution opportunities. And even if you aren’t the person working on paid or outreach or SEO, it’s important to understand how they all work together. 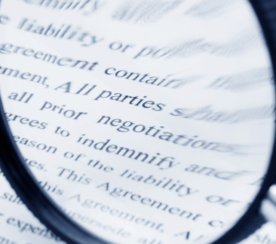 Owned media properties and content are anything that you direct and control. As you can see in the chart above, this includes anything from websites to your own social media pages. You can fill these spaces with any content that you choose to help attract, engage, and convert your receiving audience into paying customers. Most marketers understand the need for some form of owned content on their website, but the exact mix of what social accounts to use, etc. really depends on where your audience is. Since you have control over the messaging with owned media, it’s an important category to not only start but grow over time. There are tons of different ways to advertise online — from PPC and paid social, to display, to paid influencers and native advertising. Paid media placements allow you to get in front of a new audience more quickly than organic strategies but they can only stretch as far as your budget allows. Much like owned content, you can use these spaces for lead generation, or content amplification and awareness, or both. It all depends upon your end goal. Most of the time, you are using paid media to pull people into your owned platforms so you can either continue to market to them or convert them to a sale. Earned media is any coverage on platforms that you don’t own and you’re not paying for. This is what was used to be called public relations but has morphed into so much more with all of the digital platforms at our disposal today. Earned media allows you to get in front of a new audience. But this time you don’t have to pay for it. Earned content could be something as far-reaching as a major publication covering a story about your brand or it could be something as simple as a customer sharing their purchase with their friends on social media. Earned media is a scalable way to grow while driving down your customer acquisition costs but you have to monitor it because you don’t have complete control over the message that’s being shared. 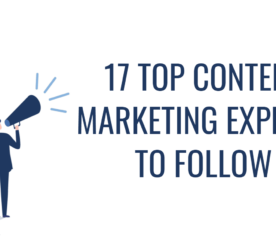 Once you start thinking about your marketing opportunities in this lens, it becomes a lot easier to prioritize strategies that will help you grow leads and sales. A healthy marketing plan takes each category into consideration but a great marketing plan blends them into new strategies that are better together. For example, instead of just sharing a blog to your social media platforms, consider putting a little money toward boosting it to influencers who may be interested in the content. If the content is worthy, you may earn some additional shares or links beyond their sphere — now you have owned, paid, and earned all working together to grow your presence exponentially. Consider your goals and the opportunities in your industry. Everyone’s optimal mix looks different but you should stop settling for cold cheese and tomatoes. Find out which recipe works best for you.